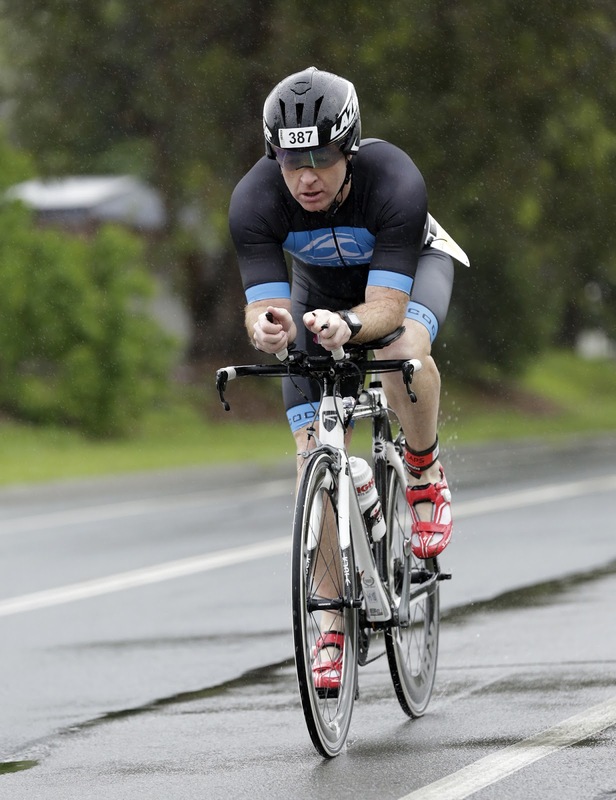 If triathlon history was a currency, Forster would be as rich as James Packer. Being a keen student of the sport, I was looking forward to etching my name in the annals of also-rans at the iconic mid north coast venue. A late change of schedule by event organisers meant I was up at 2:30am to get to the race. Torrential rain all morning made setting up for a split transition a little uncomfortable, even for a pluviophile like me. The announcement that the swim would be a non-wetsuit affair was met with the usual groans of disapproval from most competitors and it wasn't long before we were in the soup-like water of Forster Keys. The swim is currently my Achilles heel. I exited the drink eighth in my age group. Ok, there was only 14 in that category, but six of them were still flailing behind me. If anything I felt better than I had in recent races on exiting. This is no doubt due to my increased swim volume since I have began training under the guidance of Project M Training. I jumped straight on the pushy & ripped in on a fairly flat course. The hardest part was keeping an eye out for pot holes on the rain affected circuit. I managed 5th in my AG in a very enjoyable ride, despite the slippery roads. Entering T2, a jack-knifing shoe saw one of my Specialized Tri-Vents spear out of the pedals about 10 meters from my bike rack, I lost a few seconds retrieving the wayward piece of footwear. I saw a pro do exactly the same later in the day so that makes it ok right? I've had a tendency to take off like a scalded cat on the first km of the run. I concentrated on keeping that more measured on this occasion and build towards a stronger back end. Despite a tightening right hammy at around the halfway mark it was a much more consistent effort and fourth fastest in my category. In the wash-up, I managed to grab third in my AG and 30th overall. It was an enjoyable experience and I'd definitely recommend Challenge Forster as a destination for any triathlete. There's plenty of work to do and I'm looking forward to another sprint at the picturesque Huskisson in two weeks time.